Work-in-progress image of a merchant starship I'm creating. Lower deck is cargo, fuel, and landing gear. 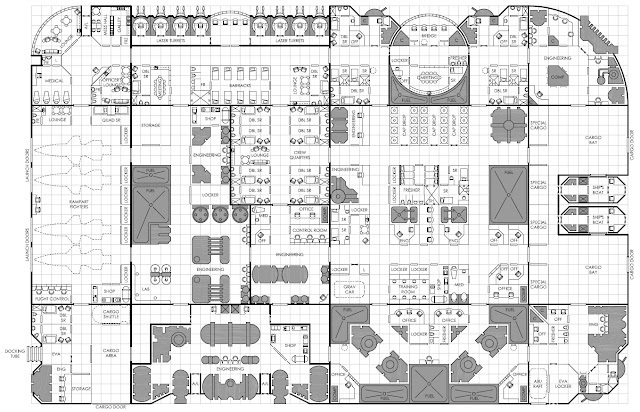 Upper deck is engineering, fuel, crew staterooms, lounge, air/raft garage, and bridge. I'll post more images and deck plans as they're completed. A little something to add some flavor to your next stop at the starport. Inspired by Chris Buono's Benign Wilderness Encounters and Benign Urban Encounters for fantasy settings, here's my list for the Traveller Universe. (Highport only) Through a viewport the PCs can see SPA security practicing zero-G maneuvers. (Highport only) Through a viewport the PCs can see vacc-suited workers operating on a communications array. (Highport only) Visitors are treated to an amazing planetary sunrise from a large viewport. A beggar in an old Scout jumpsuit asks for a handout. A black market trinket dealer scoops up his wares at the approach of a SPA security officer. A clinic is offering free inoculations for travellers prior to exiting the starport. A concerned looking team in hazmat gear run past the PCs. A crewman's duffel bag sits unattended in the corner. A criminal in handcuffs is marched past. A customs inspector argues with a cargo handler over mislabeled cargo. A customs inspector reviews a ship's cargo manifest with the ship's captain. A dealer in alien artifacts is looking to sell his goods. A dilapidated cleaning robot tries to vacuum around the PCs, bumping them aggressively. A disaster preparedness team is going through emergency drills. A Droyne stops the party and tries to communicate, but none in the party speak Droyne. A family stares at overhead monitors, trying to figure from which bay their ship departs. A food merchant hawks his overpriced "authentic" foodstuffs from another system. A food merchant is giving out free samples, trying to drum up more business. A well-dressed megacorp employee is interviewing parties willing to do a job "off the books". A group of Vargr adventurers is looking for passage to the next star system. A group of asteroid miners are looking for investors. A group of grungy engineers are shooting dice for cash. A merchant, stuck with several tons of fruit and desperate to sell it before it goes bad. A group of intoxicated marines stagger past. A group of marines are joking about their last mission. A group of performers entertain passengers of a delayed flight. A group of refugees looking for passage out of the system. They've been stranded at the starport for weeks and are running out of items to trade. A group of religious pilgrims stand at a window watching a ship loading cargo. A group of academics talk excitedly regarding cosmic events in the local star cluster. A Vargr Corsair has just docked and a group of rowdy Vargr mercenaries pour out, possibly looking for trouble. A troupe of zero-G acrobats are performing and promoting a performance later in the week. A heavily cyber enhanced mercenary is looking for passage to a nearby war-torn system to sell his skills. A hustler is offering half price Mid Passage tickets.They are high quality counterfeits. A large, muscular dockworker sits quietly reading from a datapad. A local dissident hands the PCs a flier with information against the local government. A local health agency is screening all incoming visitors for communicable diseases. The screening process is quick and painless. A local tries to sell the PCs some locally made clothing. A mad 'prophet' stands on a crate preaching against sins of the flesh. A maintenance crew is working on a sub-floor communications line. A maintenance man is upgrading security cameras. You overhear him report the system will be down for the next 30 minutes. A maintenance panel falls from above, nearly hitting one of the PCs. A medical ground vehicle drives by with its sirens and lights on. A merchant captain argues with a broker regarding several crates of rotten vegetables. A used robot merchant approaches the PCs with his sales pitch. A middle-aged woman looks furtively around, then enters the TAS VIP lounge. A nearby child begins screaming about monsters. A noblewoman and her entourage pass by. A bodyguard pushes one of the PCs out of the way. A pair of novice travellers are photographing everything, including the PCs. A purse snatcher and his pursuer rush past the PCs and disappear into the crowd. A small, nerdy boy is trying to explain to an overconfident smuggler that a parsec is a unit of distance, not time. A security team is performing a "floater sweep", attempting to remove all transients and beggars from the starport. A ship's engineer tries to negotiate with a vendor for a better price on ship parts. A shuttle arrives to take a group of employees back to the staff housing area. A skip tracer team discusses their next repossession. A small freighter departs its berth in an obvious hurry, while security guards fire upon it. A small rodent is seen heading in the direction of the food court. A small, but vocal portion of the local population are fanatically anti-Imperium. A starship crew is selling random cargo to raise enough cash for fuel. A stranded traveller is seeking working passage so he can get back home. A team of Crash, Fire, and Rescue (CFR) paramedics rush to the infirmary with a patient on a gurney. A traveller is insisting that items in his luggage will be damaged if scanned. A very long line leads to the public restrooms. A very drunk and dirty war veteran will tell you his life story for a drink. Or leave you alone for a drink, if you prefer. A Virushi medic offers salutations in Galanglic to the PCs as it lumbers by. A young couple at a booth are asking for donations for a local charity. All travellers must undergo a weapons/contraband check to get into the next area. An information kiosk lists advice on the local customs. An information kiosk provides information regarding employment opportunities. An information kiosk reminds travellers of the local law level, restrictions, and contraband items. An old mercenary is looking for one last ticket with hopes of going out in a blaze of glory. An older gentleman approaches the PCs and asks them to watch his luggage… just for a few moments. An overturned catering vehicle slows traffic to a halt. There are frozen peas everywhere. An SPA administrator is overheard talking to the port casino owner about revenue reports. An SPA agent is confiscating a distraught woman's small pet to be quarantined. An SPA crew performs a safety inspection on a starship. An SPA official argues the finer points of trade tariffs with a merchant. An SPA security guard has detained a traveller who appears to be of Zhodani decent. An SPA security guard on patrol walks by, eyeing the PCs suspiciously. An SPA traffic controller is seen in a corner booth of a bar, shaking visibly. An unemployed engineer checks the job board for available crew positions. An unexpected security checkpoint ahead will reveal any hidden weapons the PCs may be carrying. An Xboat crew enjoys a last hot meal before departure. Environmentalists are protesting against a recent fuel spill. It is rumored that many of the planetary customs officers are corrupt and can get anything over the XT line for the right price. Judging by the smell, the air recyclers in the section need major repair. Large crates sit guarded in an open alcove with "Evidence" tape stretched across them. Lights flicker in this section of the starport. Local law enforcement is trying to extradite a criminal who escaped capture and made it into the starport. Nervous adventurers looking to unload a cache of alien artifacts and unknown weapons from the an illegal archaeological dig. News terminals report a minor crash at a different spaceport occurred earlier today. There were a few fatalities. One of the PCs finds a 50 credit note. One of the PCs is approached by a drug dealer. One of the PCs is approached by a prostitute. One of the starport shops is being picketed by employees demanding better pay. Overhead speakers call for all SPA department heads to convene in meeting room 7-C. Overhead speakers call for Crash, Fire, and Rescue (CFR) paramedics to respond to a cargo handling accident. Restroom graffiti has interesting things to say about the SPA Director's parentage. Several large, horned herbivores have escaped from a makeshift corral in one of the docking bays. Slidewalks in this area are out of order. Some unattended children pester the PCs. SPA security follows the PCs for about 15 minutes. The Alliance of Starport Mechanical Engineering Trades (ASMET) union is on strike, slowing down starship repairs. The PCs notice an SPA records department employee leave his datapad at a restaurant table. The PCs see a small merchant ship being fitted with a new turret. The PCs see an advertisement for a local safari company. The restrooms in this portion of the starport are closed for cleaning. The SPA is auctioning off last year's collection of unclaimed lost and found items. The SPA liaison officer is in a heated discussion with a local politician. The Starport Director is leading a tour for the SPA Inspector General. The starport has recently passed a new tax levy on luxury craft. The starport infirmary is dealing with some sort of viral outbreak, but determined no quarantine is required. The starport is currently hosting its monthly farmer's market of local goods. The sweet smell of reconstituted synthetic foodstuffs fills the air. This area is marked with what appears to be small arms fire damage. This section of the starport seems oddly deserted. This starport apparently has no restrictions against carrying firearms openly. Two figures can be seen whispering in the shadows of an otherwise empty passenger lounge. Two retired Scouts sit swapping tales of adventure. Two SPA security guards are posted at an unmarked door. Some sleazebag asks you if you want to buy some deathsticks. A weary Aslan diplomat it trying unsuccessfully to catch some sleep in an uncomfortable plastic chair. A small, domed robot bleeps feebly as it looks for its lost owner. Two aging celebrity athletes relive their glory days as professional grav-ball players. An occasional passerby will do a double take, then ask them for autographs. A loudmouth buffoon has been annoying several travellers. He makes a dumb joke about being an Ine Givar terrorist and is promptly escorted away by SPA security. A pasty-white and disheveled passenger can't stop coughing. You feel a little of his spittle on your cheek as he passes. An entrepreneurial cab driver is passing out business cards and offering safe and discreet rides to the best clubs in Startown. An attractive woman waves excitedly at one of the PCs, but in reality is waving to someone behind him. The floor in this area of the starport is disgustingly sticky, like the floor of a dollar cinema. A self-important businessman is negotiating a multi-million credit deal on his communicator, loud enough so that everyone knows it. Either that's the latest style in this region, or a lot of people here are wearing their pajamas. A young woman is seen trying to steal food from a vending machine. 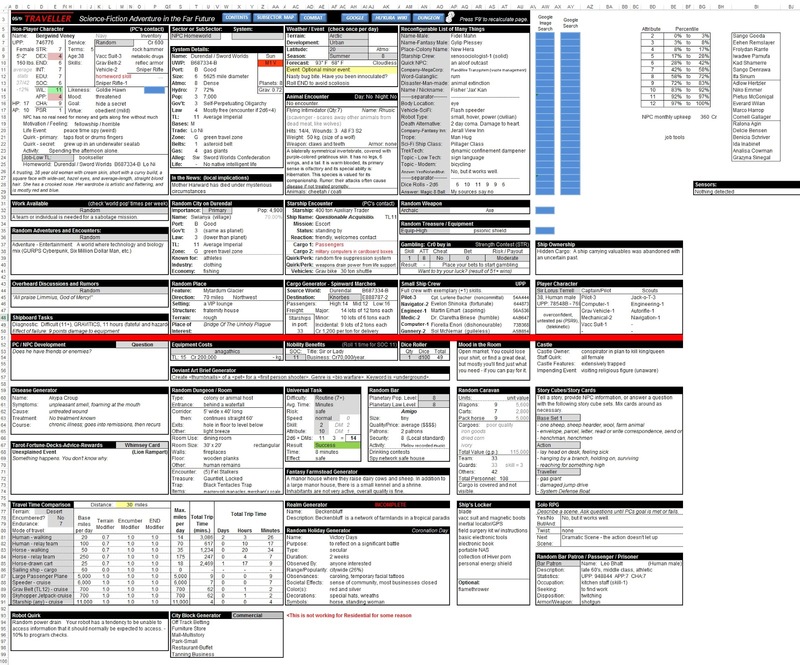 This is my Traveller Referee Emulator spreadsheet, which I use to facilitate my gaming, and because hiding behind a card stock referee's screen is sooo 1983. Inspired by Dragon Magazine #80's "Dungeon Master's Familiar" program, it has been an ongoing work in progress for over six years. That issue of Dragon was inspirational in other ways, as anyone who remembers the cover might tell you, but I digress. The UPP is strictly 2d6, with no additions for service or subtractions for aging. I figure they probably cancel themselves out anyway. Skills are limited to three service skills, one weapon skill, and one homeworld skill (someday). Simple? Yes. Lazy? Most certainly. Effective? Absolutely. If the NPC starts to become a major NPC, add more skills if necessary. The UPP includes Willpower, Appearance, and Charisma. Good for sizing up your random encounters and determining if your hireling will follow your orders when the heat is on. It points out high and low stats: 2,3, and 4 in red, 10,11, and 12 in green. This makes it easier to quickly see what the NPCs strengths and weaknesses are. 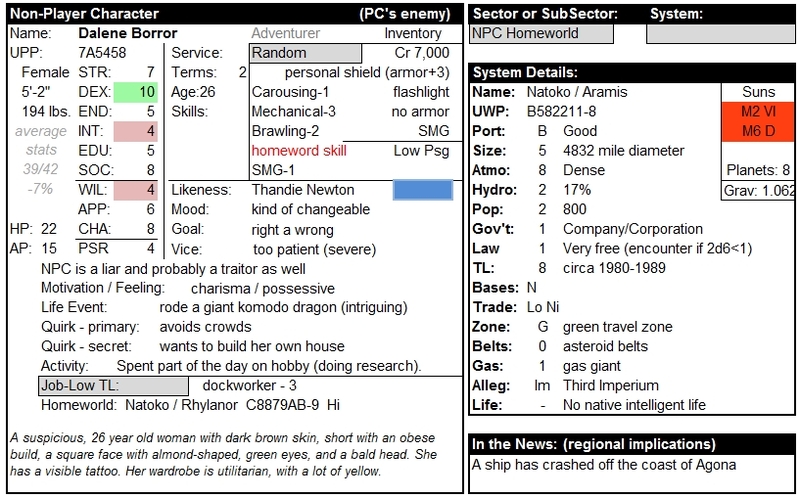 It provides at a glance a suggestion of who the NPC might be relative to the PCs. The NPC is either an ally, contact, enemy, informer, rival, or patron. Likeness - a list of celebrities and other famous people. This is one I stole from "The Traveller" comic strip in White Dwarf magazine and it goes a lot farther in making an NPC come to life than I would have thought. Likeness can be just the physical appearance, or more usefully, mannerisms they, or in the case of actors, their characters have. The blue button next to the name links to a Google Image search for that person. In cases where the dice conflict with other information in the description, I usually let the dice win. Sorry, Dalene, you only look kind of like Thandie Newton. You're still only a 6. Life Event - one if not THE major event in the character's life. The NPC sees the event as sad, funny, weird, inspiring, or intriguing. Alternate Jobs/Services/Classes - sometimes you just don't need a standard Traveller character. This gives a basic idea of the NPC's job and their skill at it. It can be linked to the NPC's homeworld, so you can get even a better understanding of where the NPC came from. 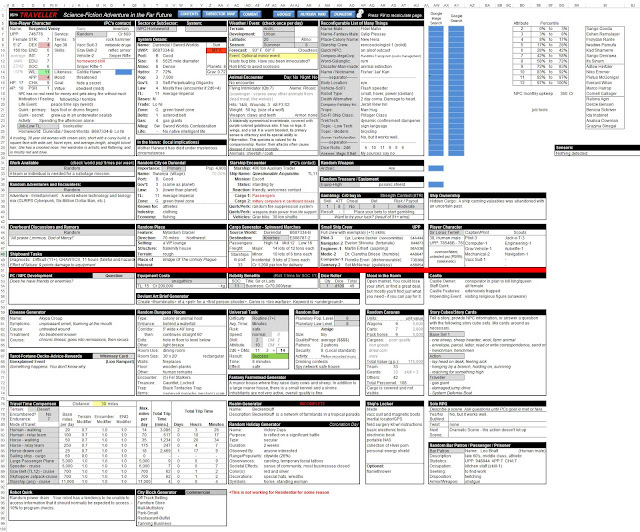 Basic system information including color coded stars and planetary bodies. It's not much, but it provides a little extra flavor when entering a system. In this case you can quickly describe the system as having two red suns. I'm pretty sure the stellar classifications are canon. The number of planets is randomized, so definitely not canon. Main world gravity - which is something I'm always forgetting to incorporate into gameplay. Again, just a little extra flavor, but randomized. Something is always going on outside the PC's little world, and this little gem tells you what's happening and at what scale. Maybe it's nothing, maybe it's a red herring, or maybe it's the players' next great adventure. 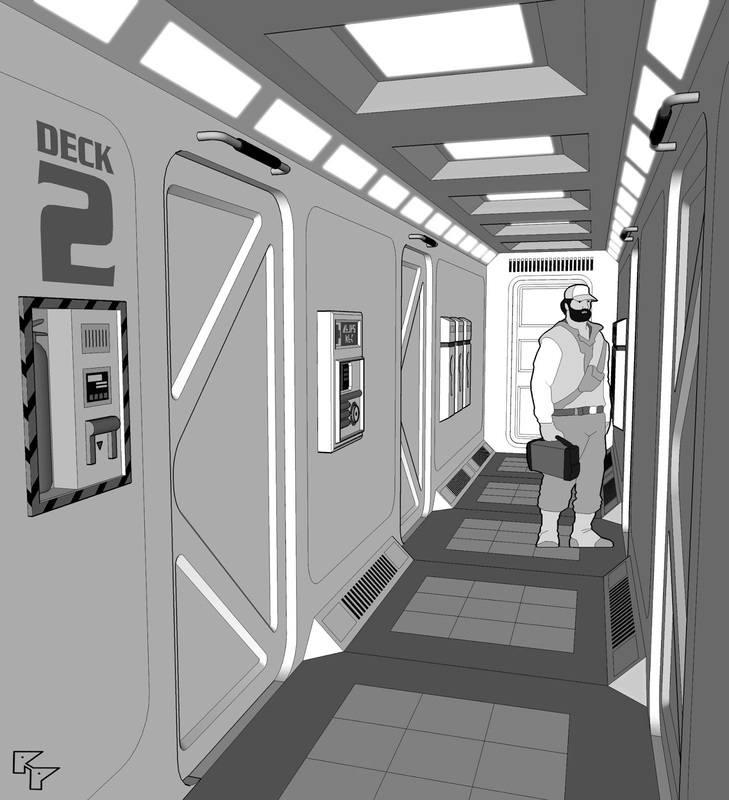 Ship's engineer "Scruffy" Vitella returning to his stateroom after a hard day's work. "Scruffy" (again), coming to replace the O-ring (again) on the highly over-rated Naasirka Zero-G Squat-O-Matic PR77 Waste Collection System. Tox Borgnine, down-on-his-luck ex-rogue, who somehow talked his way into a working passage steward position on this ship, come to change your linens. Passenger and planetary geologist Galt Cubbage, returning from today's dirtside excursion. He tends to leave his boots in the airlock to avoid tracking mud all over the ship. Not sure who this guy is. Is he even on the Passenger Manifest? He's just standing in the corridor - says he can't find his room card. 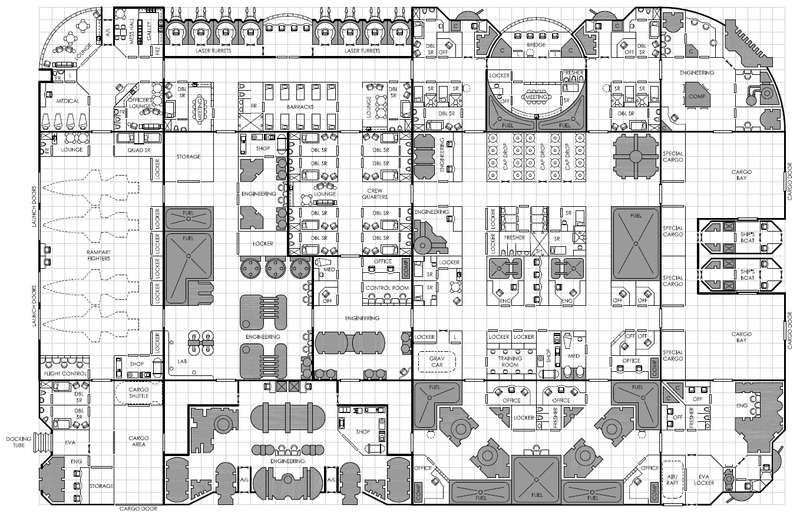 An example of a random starship geomorph configuration including two 100'x100' centers, six 50'x100' edges, and four 50'x50' corners. Like any kind of random generator in gaming, the result may not make complete sense, but is quick to generate and serviceable. Given the number of guns, fighters, and cargo space, this configuration might be suitable for a 1,200 ton military armed transport.